Reaching out to everyone in the blogging community, and thanking you for friendship, support, and lovely comments over the years. I appreciate you all so much! I look at my 'followers list' and I am amazed at just how many wonderful readers are out there! You all mean the world to me. You may not always get a daily visit or even comment from me.......but I sure try! I cannot believe that I have this many wonderful readers, or that so many bloggers come here ...going on three million visitors. It is mind boggling to me and I am so grateful that all of my hard work and sharing has found an audience! You need to know that I try to visit 25 follower's blogs a week that are new to me, 100 a month, and follow all of the regular readers, here....by reading a dozen of your blogs each and every single day on top of visiting any and all AAQI readers (those who donate quilts or buy them) blogs every time you post something new. I have over 1,000 blogs in my own reading list and each one is just as much fun as the last one...and I don't care if you have huge things to write about or show, or just small things. Each thing is who you are and unique and fun for me as a way of getting to know you! I am a huge blog reader and blog hopper no matter how busy I am or how many challenges life throws at me. If you expand my blog list it will show the last 100 new blog posts that I follow. It doesn't hold more than that many n the view at a time. About 500 of my followers have blogs of their own and I truly try to visit different ones each day, no matter how busy I am...you mean that much to me! There are angels among all of you, who reach out to others with loving hearts during hard times. They often don't realize just how much it meant and how if lifts hearts and spirits during challenging times. You leave me blog comments, send little emails and once in a while ask for my address and mail me a little something that brings tears to my eyes! To Wendy who mailed me art quilting supplies for use in my AAQI quilts, to Darlene, and June, and Debra, who have mailed me lovely bits and pieces to sew with, to Julie who sent me the sweetest book of haiku and photos of her beautiful quilts, to my teddy bear loving friend, Pat, who sadly just lost her husband, but is still helping ME by being such a dear friend, to my every supportive Canadian friends Anna, and Scrappy Quilter, and the lovely Aussie lass, Lynne... and so, so many others who never fail to comment or send me little notes of cheer. Thank you to everyone..too many to list and name who read here, leave supportive comments. Blessings to new readers who thank me for the free pattern lists and who say kind things about this blog. I have readers from all over the world, people and I love that, love visiting your blogs, and using the translator to write you back when I can! 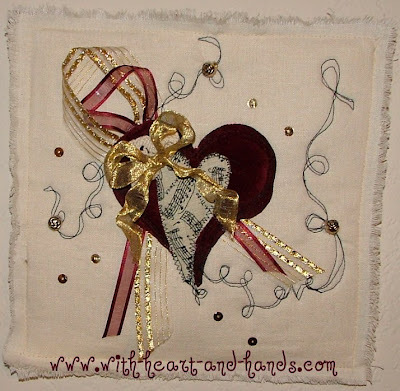 Feel the love coming out to you from me in this second little heart art quilt that I made to showcase Valentine love! May it sing out to you with gratitude and caring and joy even through challenging times! Happy Valentine's Day to every single one of you!!! Great post, Michele. I apprecate your thoughtful writing and comments and your sidebars full of links and your devoted promotion of AAQI all while caring for your elders. Happy Valentine's day to you! Isn't blogland wonderful? I'm always inspired and amused. Happy Valentine's Day to you! Oh yes, yes, yes! Let me float on air. So much better than feeling tied down and worn out ;) Love you Angie! Bless you, Brenda..check out Brenda's blog, her quilting is amazing!!! And my other one 'l' Michele..I call her Chele, so I don't get her and I mixed up ;) is wonderful. Check out her cooking AND her quilting!!! One "l" Michele - that brings back memories of a place I worked where there was a one "l" and a two "l" version. I am not a follower per se because I come here from someone else's sidebar. I read often and am always humbled by the depth of your love in every situation. Blogland allows me a certain freedom of visiting people and seeing what I need to learn about life, love and quilting. I think I am guided where I need to be usually. Wishing you a Happy Valentine's day, Michele! Your online presence is felt by so many of us all over the world. Thank you for your kindness and thoughtfulness. Happy Valentine's Day to you Michelle, hope you have a wonderful day. Happy Valentines Day dear friend. Thank you for being you and for working so hard to keep the quilting blogging community alive. What a lovely, lovely comment! And that is what I love about Blogland, too! Thankyou so much for your visits. I always love your comments! Oh, dear Nellie, one of my always favorite bloggers with such creative talent. If you have never been to Nellie's blog...run and check out her beautiful work! And Clare, my crazy mad English woman friend living in France. You never fail to inspire, and to support!! I have a grandaughter who is a one l Michele and she says its far more popular now than it used to be. It must be nice to know that people will think twice before spelling it the usual way. I have a hard time keeping up with just a handful of blogs, never mind looking for new ones all the time! You are remarkable in your outreach and the support you offer to everyone you meet online. You are often in my thoughts and prayers. When I needed an idea for a quick quilt a couple of weeks ago your list was the first place I looked - and of course I found the perfect thing! Fabulous,Sue..one of the nicest things you could have told me. I love knowing that the hard work of collecting my lists helps others! Thank you for sharing that!!!!! Late I may be but sending love your way anyway!